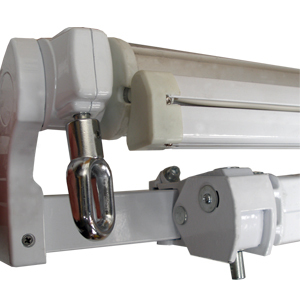 40mm Bracket for standard manual, half cassette with long projections and 5m - 6m half cassette awnings. This is a replacement bracket with expansion bolts for our standard manual,half cassette with long projections and 5m - 6m half cassette awnings not suitable for half cassette manual, electric awnings (1.5m - 3m projections) and full cassette awnings. If you have a standard manual awning with an alignment adjuster (where the arm attaches to the torsion bar, same as image below) then this bracket is suitable for your awning. If however your awning doesn't have this adjuster, you have an earlier model 2007 standard manual awning and need different size brackets (30mm brackets). Please click here for the 30mm brackets. "Just what we needed. Would order again if needed." "Excellent service, but this bracket consists of two very small pieces of metal, spot welded and dipped, so it's expensive for what it is." "We bought extra brackets just in case, although they are pricey - that outweighed the safety aspect." "Brilliant service. Arrived on time." "the product arrived promptly, but is not the same as the ones that came with the canopy, a slightly inferior one and the fixing bolts were different as well." "Brackets well fitted. Delivery so fast next day and didn't order till night before. Impressed"
"Excellent item, exactly as described."